Our latest cultural excursion took us just a few blocks away from our apartment, as we finally made time to visit the Whitney Museum (instead of just walking past and saying we really ought to go in). 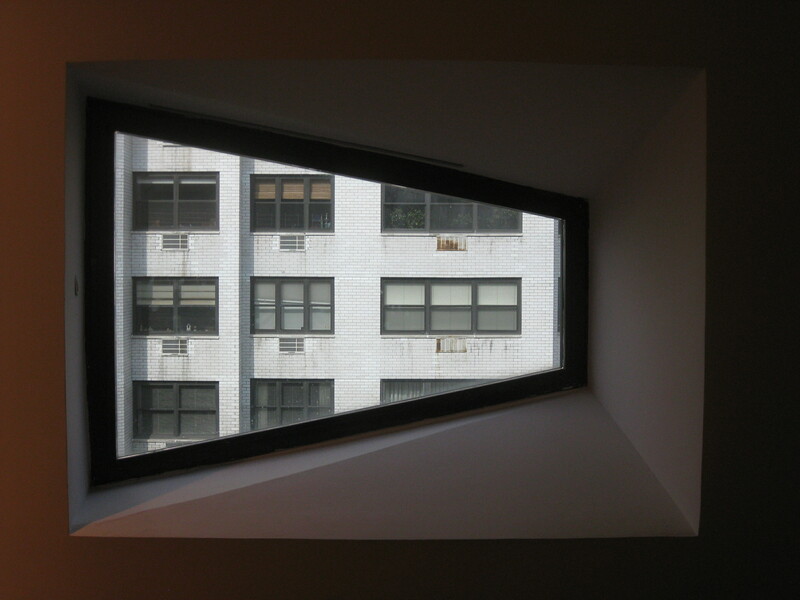 One of the most striking things about the exterior is the asymmetric design of the windows, and from inside some of the views were just as interesting as the works of art on display. The Whitney collects work by 20th and 21st century American artists, and we enjoyed seeing exhibits by one or two who we actually recognised (I never tire of Calder mobiles) as well as discovering some interesting new-to-us artists (Oscar Bluemner in particular). One floor was dedicated to an exhibition of Edward Hopper’s work which concentrated mostly on his skills as a draughtsman, placing a handful of his lovely paintings in the context of their preparatory sketches as well as showing a whole host of his other drawings. We’d come across Hopper before, of course, but I really hadn’t appreciated his skills properly, so this was a fantastic (and enjoyable) learning experience. 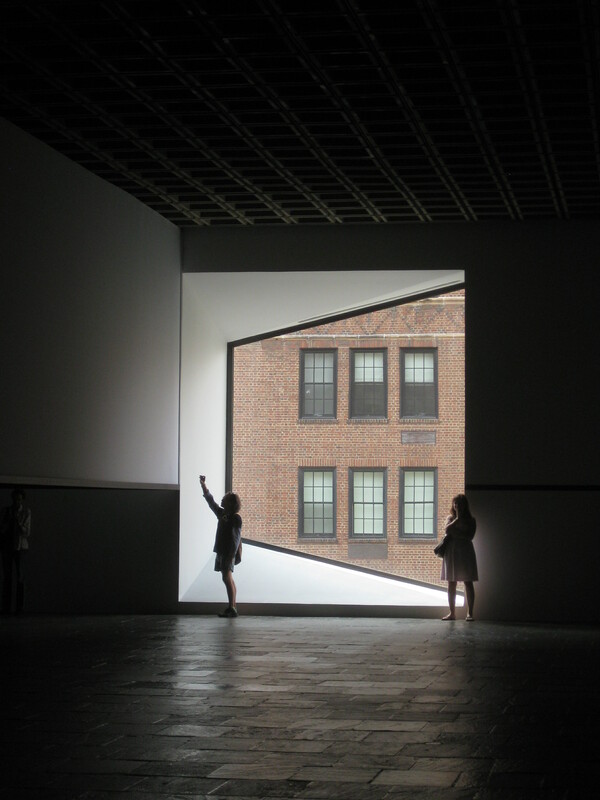 As luck would have it, we were there just before the end of the latest exhibition of Robert Irwin’s 1977 piece Scrim veil—Black rectangle—Natural light, Whitney Museum of American Art, New York. The work has been on display this summer for the first time since its creation, and as you’ve already guessed from the title it was made specifically for this gallery. Although ostensibly simple there was something quite mesmerising about it, and I’m sure that had a lot to do with the dramatic effect of the gigantic window at one end of the space. As with other installations like the Rain Room at MoMA earlier this year, or Olafur Eliasson’s Weather Project at Tate Modern (which I thought I saw only a few years back, but have just learned from the Tate’s website that it was a full decade ago – I feel officially old now! ), as much of the fun of this sort of thing is watching other people interact with the work as in actually exploring it for oneself, and this was no exception. This entry was posted in Museums/galleries and tagged Alexander Calder, American art, Edward Hopper, Oscar Bluemner, Robert Irwin, Whitney Museum by Emma Davidson. Bookmark the permalink.